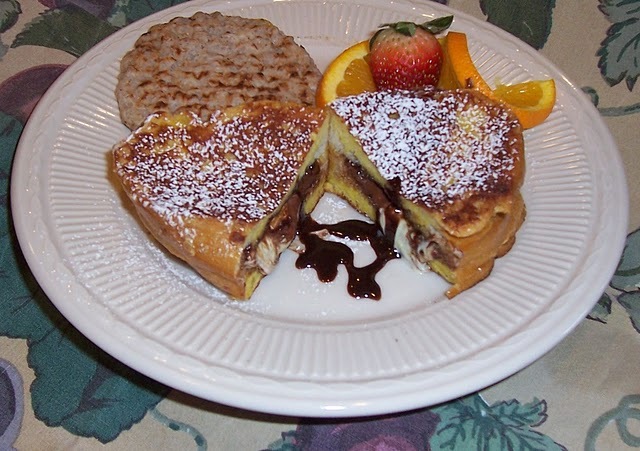 This is one of my favorite ways to enjoy French Toast. It’s rich and warm – just the way I like my men 🙂 Sometimes we make a warm strawberry sauce to accompany this dish, but really, it’s darned good just as is, sprinkled with a little powdered sugar. Preparation time about 15 minutes. Cooking time 15 minutes. Slice the loaf of bread into 16 slices. Pair slices to have 8 “sandwiches”. On the inside of each sandwich slice, spread about a teaspoon of chocolate hazelnut spread. Put a square of white chocolate on one of the slices and top with the other to make a sandwich. Beat eggs with evaporated milk, sugar and almond extract. Dip the sandwiches in the egg batter. Put in a deep dish and pour remaining batter over top and allow sandwiches to soak and absorb the batter, preferably for at least 10 minutes. When ready to cook, melt butter on a griddle or skillet set on a medium/low setting. (We use 275 on our electric griddle). Put the sandwiches on the griddle and cook until browned on each side and cooked through. I allow about 8 minutes per side.